November 4, 2015 (Alexandria, VA) – The DC region’s Shop Small destination for independent boutiques is gearing up to kick off the holiday shopping season with an alternative shopping experience. Consumer trends indicate that shoppers are seeking a more satisfying experience for the whole family that also contributes to the heartbeat of a community. Alexandria, Virginia, is pleased to announce their plans for this year’s Black Friday (Nov. 27) and Small Business Saturday (Nov. 28) efforts to appeal to those shoppers. 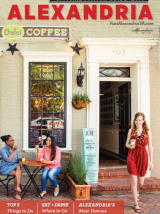 Since the launch of the city’s efforts six years ago, Alexandria has seen an increase of patrons who are choosing to “Shop Small” on days that were historically dominated by big box stores. According to the National Retail Federation, holiday retail sales are expected to grow by 3.7% in 2015. In addition, 70% of American consumers will be shopping at local small businesses and boutiques this holiday season. The top reasons for these shoppers to shop local are to support the local economy and find one-of-a-kind gifts. (Source: Deloitte 2015 Holiday Survey) 80% of the shops and restaurants on King Street (in Old Town) and on Mount Vernon Avenue (in Del Ray) are independently owned. New this year is Alexandria’s Random Acts of Holiday Cheer promotion, from Monday, November 23, to Small Business Saturday, November 28. Scottie Dog Prize Hunt (Nov. 23-28) - Several stuffed animal Scottie dogs will be placed throughout Old Town and Del Ray with each having a prize attached to it from an Alexandria business. Follow Visit Alexandria’s social media channels to find clues of where the dogs are hidden. Individuals participating in the hunt are encouraged to hashtag #ALXscottie and #ExtraordinaryALX. Swag Bag Giveaway (Nov. 28 – Small Business Saturday) - Alexandria Chamber of Commerce will be handing out approximately 250 bags filled with gift cards and goodies from Alexandria businesses at Market Square in Old Town from 9AM-12PM, and in Del Ray in front of the Holy Cow restaurant from 12-1PM. Spot A Bag Contest (Nov. 28 – Small Business Saturday) - In partnership with the Old Town Boutique District there will also be a “Spot The Bag” contest – individuals spotted toting shopping bags from one of our Alexandria boutiques, will be selected to win special prizes. Black Friday Alexandria returns Friday, November 27th, with over 50 independent boutiques opening early to kick off the shopping season with one-of-a-kind shopping deals on designer and coveted merchandise, including home décor, chic fashions, gourmet food, classic toys and gifts for dogs. Most participating stores will open at 6 a.m. offering 30% discounts from 6 to 8 a.m., 20% from 8 to 10 a.m., and 10% starting at 10 a.m. Store offers may vary. The City of Alexandria is offering free parking at parking meters and City-owned garages as a special incentive for shoppers on Black Friday. The Free King Street Trolley will begin operating at 6 a.m. so shoppers can visit more shops and bag even more bargains. Alexandria is the DC region’s Shop Small headquarters for Small Business Saturday. Locally owned boutiques throughout Alexandria will offer special promotions, including merchandise discounts, gifts with purchase, complimentary services, treats, and/or festive activities for shoppers to enjoy. New this year, Random Acts of Holiday Cheer will surprise Alexandria shoppers with an elf prize patrol, busker-style caroling in the streets, a swag bag giveaway, and the “Spot a Bag” contest. Just minutes from Washington, D.C., visitors can feel transported by an old-fashioned sense of holiday wonder on Old Town Alexandria&apos;s centuries-old brick-lined streets, twinkling with holiday traditions and magical events. Bask in the warmth of time-honored festivities like the Campagna Center&apos;s 45th Annual Scottish Christmas Walk Weekend, featuring a parade of Scottish clans and Scottie dogs, as well as the Holiday Boat Parade of Lights on the Potomac River. Reminiscent of a simpler time, dozens of independent boutiques welcome you with greenery at their doorsteps, offering everything from chic fashions and home décor to classic toys and gifts for dogs. Duck into cozy cafés and chef-driven restaurants tucked into 18th-century buildings to warm up with loved ones and good cheer. Under a canopy of sparkling lights, a stroll on historic King Street is like being in a real-life Dickens Village, complete with European flair. Named a Top 10 Christmas Town by HGTV, Alexandria offers an authentic holiday experience – the way it was meant to be. For more information, go to www.VisitAlexandriaVA.com/holidays.